Scranton bathroom stalls are manufactured with HDPE solid plastic material. Scranton’s restroom stalls may be mounted as floor anchored with overhead braced installation, ceiling hung or floor to ceiling anchored. They are available in a variety of color options and orders ship within 2-3 weeks. If you are looking to renovate an existing, or have a new construction project requiring new commercial bathroom's we can help with the material selection process, layout, design and pricing. Hiny Hider bathroom stalls are made from solid HDPE plastic material with color through. Hiny Hider partitions provide customers the freedom to create unique, attractive interior spaces in floor-mounted overhead-braced, ceiling hung or floor to ceiling configurations and can be made for any fire rating you may require. All constructions are available in ADA-compliant configurations. With tough construction and rugged good looks, Hiny Hiders partitions offer durability that will save customers time, hassle and maintenance costs. Hiny Hiders partitions offer superior value that simply can't be beat by the competition. Hiny Hiders is one of the longest lasting partitions out there and comes in class a, b, and c fire rating. They will not rust, corrode or delaminate, they have a common chemical resistance, they can be power washed and never need painted. They are waterproof, have color through, they are graffiti and vandal resistant and steam cleanable. They come with a 25 year warranty. They are also available with the option of continuous hinge. Hiny Hiders are a low maintenance bathroom partition system. Eclipse bathroom stalls are made from solid HDPE plastic. They do not require pilasters because of the custom metal framing yet still leaves clearance to the toilet. Eclipse Partitions allow for easy leveling and aligning of the doors because of the type of hinge they have. Aligning and leveling can be done during installation or maintenance. Eclipse Partitions offer high privacy, they are easy to adjust, the hinges are hidden, and they have an antigrip headrail. They also offer a no sightline option for the highest privacy. These products are available in 55”, 62” and 72” panel heights. 72” panel height is for the highest privacy option. They are also available in 30 colors and textures to match your bathroom interior. Resistall restroom partitions are waterproof, lightweight, very durable, easy to clean and come with a 5 year warranty. They are very lightweight because of the two 1/8 inch HDPE panels that are fused together to create a very strong bond. They also have a hollow core construction that allows this product to be very lightweight. They are very easy to install and are at a low cost because of the hollow core construction. Resistall Toilet Partitions can be power-washed or steam cleaned without harsh chemical cleaners. Resistall provide a great looking partition that will last without needing painted or a serious cleaning and at a low cost. The pilasters are 1 inch thick plastic and come in the choices of black, grey or beige. For more than 25 years Scranton Products’ premium brands have led the plastic partitions market setting new benchmarks for the industry in quality and innovation. Scranton Products brands feature the most durable, low maintenance and best looking partitions, lockers and industrial sheet products in the industry. They won’t dent, rust or need painting, and because they are color throughout, delamination is not a factor. The brands of Scranton Products offer the most comprehensive and trusted line of innovative products that add functional and aesthetic value, superior performance, durability, minimal maintenance, lower life cycle cost and sustainability. Durability — These bathroom stalls are impact and dent resistant, will never rust, corrode or delaminate. Scranton Bathroom Stalls will also never needs painting, as they’re scratch resistant and impermeable to moisture. They are power washable and steam cleanable. They also provide common chemical resistance and graffiti resistance, which resists pencil, pen, paint, stickers and most markers. Strong HDPE Construction — HDPE is a durable thermoplastic material that resists dents, scratches, corrosion, graffiti, and mildew. It has a density that can range from 0.93-0.97 g/cm3 and a large strength-to-density ratio. HDPE also has little branching, which gives it stronger intermolecular forces and a higher tensile strength than LDPE (Low-Density Polyethylene). HDPE is made from carbon and hydrogen atoms that have been joined together to form high molecular weight products. Methane gas is converted into ethylene, which is then turned into polyethylene by applying heat and pressure. While this overly simplified explanation might make it sound like HDPE is easy to produce, it’s important to remember it took scientists more than 53 years to figure out just the right process. That means it takes a properly equipped facility and a certain level of expertise to manufacture high-quality HDPE materials. Flexibility — Whatever your fire rating needs are Scranton Products toilet partitions have the material to match and are able to provide customers the freedom to create unique, attractive spaces in floor-mounted overhead-braced, ceiling hung or floor to ceiling configurations. All this and backed by a 25 year warranty so there is nothing to worry about. Available in 3 ADA compliant configurations. 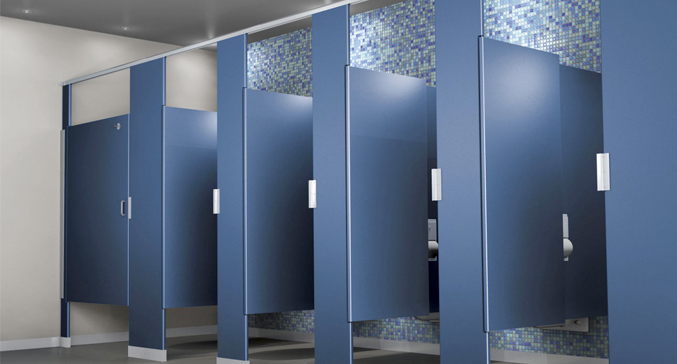 Sustainable Building Materials — When you choose high-density polyethylene (HDPE) materials from Scranton Products for your restrooms, lockers, and other interior applications, you’re supporting a healthier environment both inside and outside your facility. HDPE products help to reduce environmental impact and offer initial and long-term improvements to the indoor air quality of your projects. Eco-Friendly — All Scranton Products brands are GREENGUARD Gold Certified, which means they meet the strict certification requirements and important safety guidelines for use in schools and healthcare facilities. In fact, all of the products have a zero volatile organic compound (VOC) emissions rating thanks to their solid color throughout and no need for painting or repainting. This prestigious certification is used by the Collaborative for High Performance Schools (CHPS) as well as the Leadership in Energy and Environmental Design (LEED) building rating system. 100% Recyclable — Scranton Products’ HDPE brands are made from recycled materials and are themselves also 100% recyclable. The lockers, vanities, and partitions contain both pre- and post-consumer content and are available in 100% post-consumer material. Health Focused — On top of all that, HDPE naturally resists mold, mildew, fungus, and bacteria, making for a safer and healthier environment inside your facility. The corrosion resistant solid plastic panels are the best choice for sanitary, clean environments at hospitals, schools, health clubs, military facilities, campgrounds, and more. The HDPE partitions ship from Scranton, Pennsylvania and most of the Scranton bathroom stall orders will ship within 2-3 weeks.